If you have been wondering why there has been so much watch talk around these parts over the past couple of days, it’s because Baselworld is going on over in Switzerland. Baseworld, for those not familiar, is like the CES or MWC of the watch world. It’s a massive watch event where all the biggest watch brands in the world gather to unveil their new products for the coming year. Everyone from Rolex to Fossil are announcing products, some of which happen to be Android related. Next up, we have Nixon, a younger lifestyle-focused watch company who tends to cater to the skate or surf crowds. They announced a watch this morning called the Mission, which they are calling the “world’s first ultra-rugged, action sports smartwatch.” There are certainly other rugged watches on the market, so they must be banking off the “ultra” term here. Either way, the watch was built for abuse from waves and stuff, breh. All jokes aside, the watch features “industry-leading” durability and 100M water-resistance. It also runs the new Snapdragon Wear 2100 processor, which you can learn more about here. The display is a fully rounded AMOLED panel, plus the body sports 316L stainless steel, roll cage, Gorilla Glass crystal, custom dual-layer silicon band, and should have the best battery life of any smartwatch to date, assuming the new Snapdragon processor inside can live up to its billing. 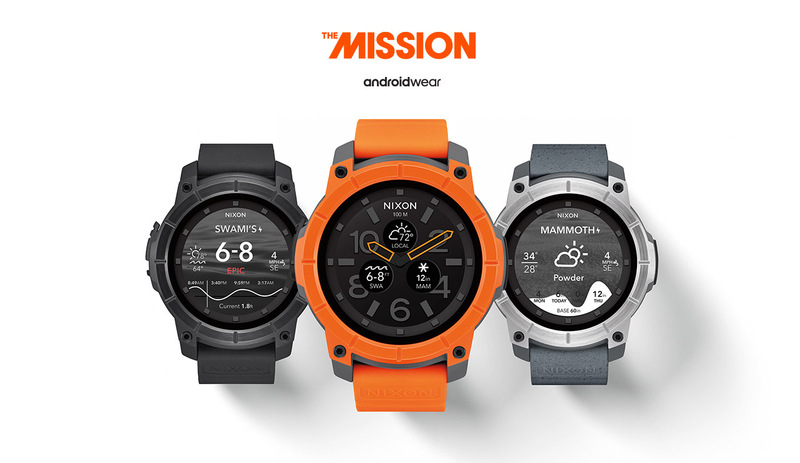 The Nixon Mission will arrive in three colors (pictured above and below) and include a couple of exclusive apps for tracking activity and getting current conditions information depending on your location. The Mission will be available later this year.